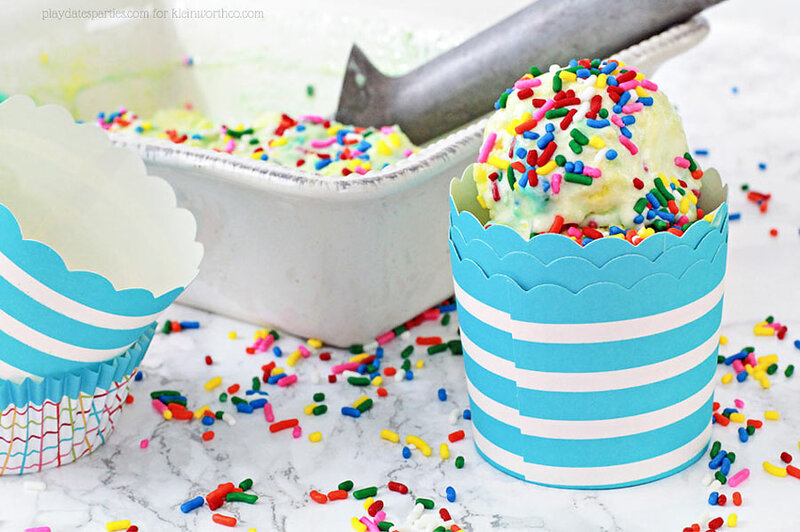 Celebrate anytime with Birthday Cake Ice Cream! 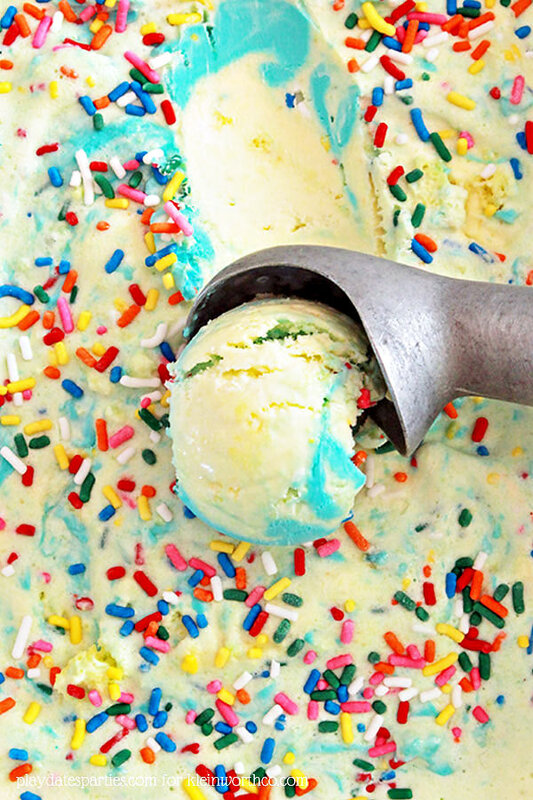 Rich butter-flavored ice cream is packed with real cake, rainbow sprinkles, and a blue frosting ribbon. YUM! Just the thought of baking in the sweltering summer heat makes me break out into a sweat. Unfortunately, our three young kids all have birthdays during the hot summer months. Hello, friends! My name is Leslie. I write over at the blog From Play Dates to Parties. There I share recipes, DIY projects, and anything to make your home a happier place to be. My 4 and 7-year-old girls start planning their birthdays months in advance. And the birthday cake is almost always one of the first topics of discussion. Over the years, I’ve started to convince them that their summer birthdays are better celebrated with ice cream than with cake. Until recently, we were limited to store-bought and no-churn ice cream varieties, but those just can’t compare to rich, creamy homemade ice cream. So when my husband gifted me an ice cream bowl and paddle that attaches to my Kitchen Aid, I was thrilled. And with summer (and my girls’ birthdays) just around the corner, I can pretty much guarantee that this birthday cake ice cream is going to be front and center for my kids’ parties. This classic kid-favorite is perfect for everyone in the family. It all starts with ice cream that tastes just like your favorite butter cake. Then bits of real yellow cake and rainbow sprinkles are added while the ice cream is churning. (We got our cake from the store, but you can use leftover homemade cupcakes or cake.) Finally, the whole thing is taken over-the-top with a ribbon of frosting folded into the mix before freezing. Author Leslie for Kleinworth & Co. In a 2 quart pot, combine heavy cream, milk, sugar & salt over medium heat until sugar completely dissolves, about 5 minutes. Remove pot from heat. While mixture is heating, separate egg yolks into a bowl. Slowly add about a third of the hot cream mixture into egg yolks, whisking constantly. Add the egg mixture back into the remaining cream. Heat the custard mixture on medium-low until the mixture has thickened enough to coat the back of a spoon, about 170°F. Stir in butter flavoring and extracts. Pour ice cream base into a shallow container and let cool slightly before covering the top with plastic wrap. This will help reduce any film from developing while it cools. Chill in a refrigerator for 4 hours or up to overnight, making sure the mixture reaches 40°F before churning. While the ice cream base cools, spread the cubed cake pieces on a sheet pan and freeze until firm. When the ice cream base reaches 40°F transfer the mixture to an ice cream maker and churn for 10 to 15 minutes. While the ice cream churns, mix the food coloring into the frosting with a whisk or a fork. This will soften up the frosting, making it easier to fold into the ice cream later. 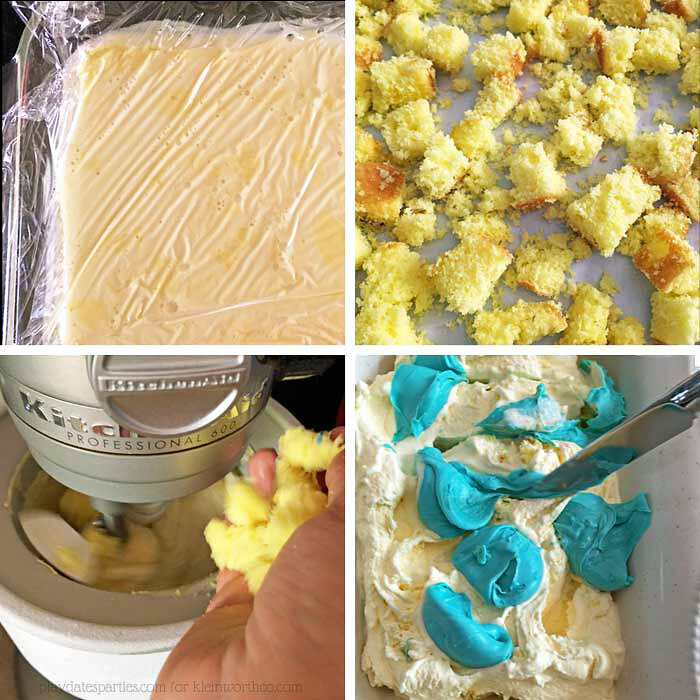 After about 10 minutes, add the frozen yellow cake pieces & sprinkles to the ice cream mixture. Continue churning for 2 to 5 minutes. Transfer the ice cream to a freezer-safe dish and place dollops of frosting on top. Gently fold the frosting into the ice cream, making sure it doesn't get fully incorporated. Cover the top of the ice cream with the reserved rainbow sprinkles & freeze for 4 to 6 hours before serving. 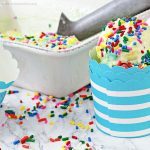 If you have any birthdays coming up this summer, save the heat for outdoors and celebrate instead with this delicious and festive birthday cake ice cream. It’s sure to be a hit! Thanks so much to Gina for letting me take over for a day. If you want to see more sweet treats and DIY projects don’t forget to check out my blog From Play Dates to Parties or follow along on Facebook, Pinterest, or Instagram. Tell me, what are your favorite treats for a hot summer day? 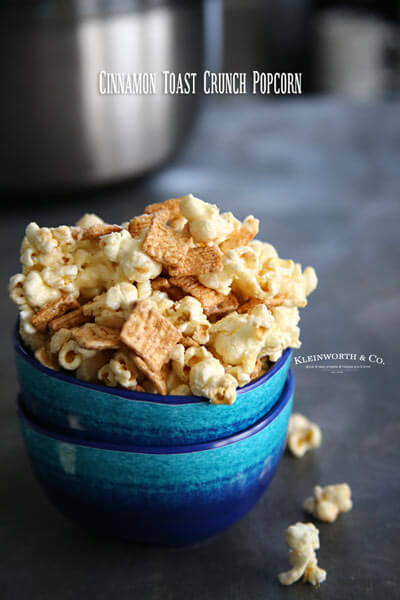 Oh wow- thank you SO MUCH, Leslie, for sharing this super AWESOME recipe. I’m drooling over it! Doesn’t this just look incredible everyone? 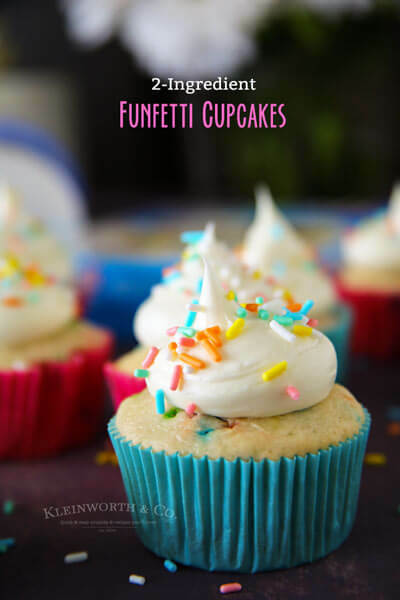 I can’t wait to make this because birthday cake flavor is my favorite! 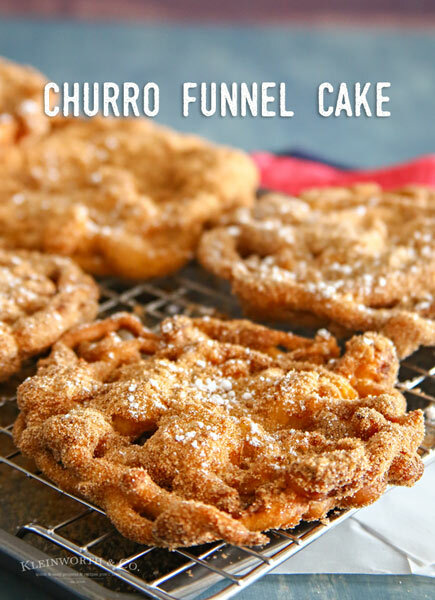 Looking for more fun dessert ideas? Oh that sounds so rich and delicious! Thanks again for having me over here today, Gina! 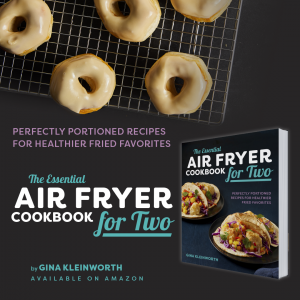 It was a lot of fun creating this recipe, and I hope everyone else loves it as much as we do! Oh my goodness; that sounds delicious! Pinned. It’s time to put my ice cream maker in the freezer so I can have this ready for the weekend. 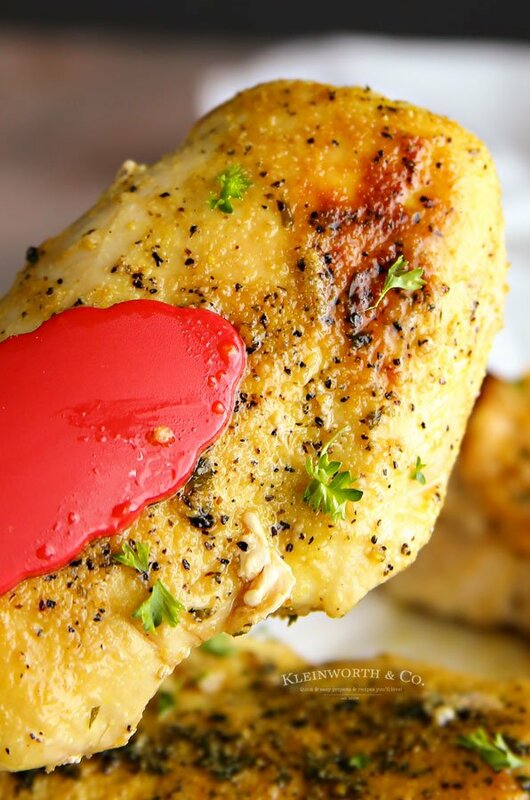 Great recipe and thanks for sharing it. This sounds like so much fun and easy to make! Thanks for sharing!